Today's scenery in Stage 15 of the 2014 Tour de France brought us through the heart of tourist Provence. Visually striking from the air, the aerial views of pools and vacation homes, fans in shorts and sandals, plowed fields and lavender, stormy skies and noticeable wind - were evidence of what makes Provence uniquely French. And one of the most popular holiday destinations in the world. I have only visited Provence five times (2001, 2003, 2007, 2010, 2012). I would have liked to have gone this year, if only to sit on the side of the road and watch the riders speed by. I would sit there with my family at a small table and chairs, wine, cheese and bread on the table, lavender as the scented backdrop, and enjoy the simple things in life. Entertained by the grueling effort of others. I'm not sure why four of my five trips to Provence centered on riding a bike up and over things, but I look back and realize that first trip in 2001 might have been the most interesting. Not the stuff to brag about, but really cool to experience. The Roman amphitheater and Mason Carrée in Nimes, the morning market in Arles, VanGogh's trail of beauty and tragedy, big tourist sights and so many quaint villages, old hotels that are now 5 star hotels, four course prix fixe meals, leisurely patio breakfasts in the garden, and going inside if it rained or the mistrals howled. Perhaps it is the cycle of cycling that I am experiencing in waxing poetic this morning about Provence. Over the years, it seems I have graduated through steps; expanding my knowledge and desire. I know a man who is doing the Etape du Tour (Pyrenees) today in France. He and his friends talk of reminding each other to eat breakfast and pee before the event race. How cute, I thought, I remember when my world centered around that sort of excited anticipation, but that was nine years ago. As the circle comes back around to complete its cycle, I find myself wanting to return to 2001 when I sat on the roadside and was inspired by others. Only this time, I'd like that nice petit déjeuner at a comfortable hotel with a blue water pool. I'd like a short morning bike ride before going to sit on that country road, where I would not take photographs but instead look into the face of each passing rider of the Tour de France peloton. And then I would sit down again to taste the chilled rose wine under the plane trees of Provence. 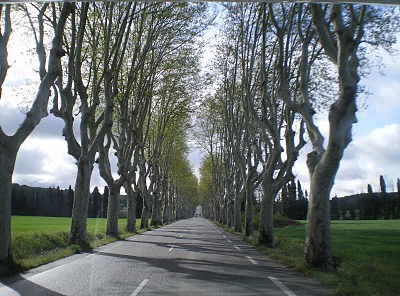 For those of you out on your early morning training rides this morning, who plan to watch the replay of Stage 15 tonight at home, here is a reading list of posts about travel and cycling in Provence. REST DAY tomorrow, if I were the teams and riders, I would relax in beautiful Provence/Languedoc. I am not crazy about the city of Carcassonne, although La Cite ruins are interesting to roam around early morning.